Perfect for potlucks, picnics or a dinner side, this Pickled Green Olive and Potato Salad will be a favorite. Fingerling potatoes with mayo, vinegar, garlic, castelvetrano olives and fresh parsley. Serve warm or cold. Summer is officially over, and along with it, almost weekly barbecues. We still plan on enjoying the occasional outdoor gatherings thanks to Bay Area weather, but it’s also time for comfort food and seasonal fall recipes. Potato salads are not just a potluck or picnic item, but also an ideal part of your fall menu. 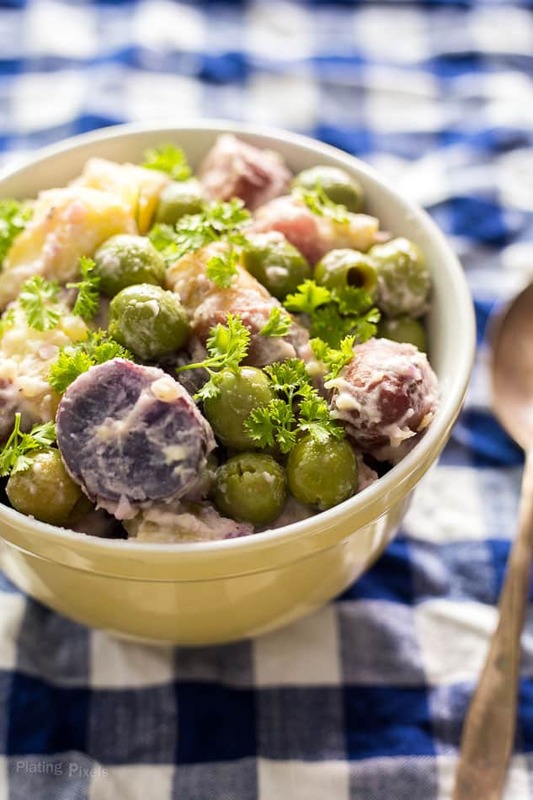 Regardless of the occasion, this Pickled Green Olive and Potato Salad might be a new favorite. It’s a simple recipe that takes less than 30 minutes total, requires only a few ingredients outside of common pantry staples, and can be served hot or cold. Potatoes are one of those staples. For this recipe I used fingerling potatoes, which have the ideal texture and firmness for boiling and salads. Look for a variety of colors to add vibrancy to your potato salad. Potatoes are a versatile, convenient and gluten-free ingredient that can adapt to almost any cuisine or recipe. Some of my favorite uses are french fries (of course), hashbrowns for breakfast, mashed potatoes during holidays, gnocchi in Italian dishes, a variety of soups, casseroles and chowders, cubed potatoes in hashes and Indian curry dishes, and any type of hasselback recipe. The culinary options and uses are almost endless. If you prefer warm potato salads, you can make this Green Olive and Potato Salad right before you’re ready to serve. If you want a chilled salad, which is my preference, cook the potatoes the day before and chill. When you’re ready to serve, simply mix together with mayo, white wine vinegar, crushed garlic, castelvetrano olives and fresh parsley. I recommend these olives specifically as the soft texture and rich, buttery flavor complement the tangy potato salad. 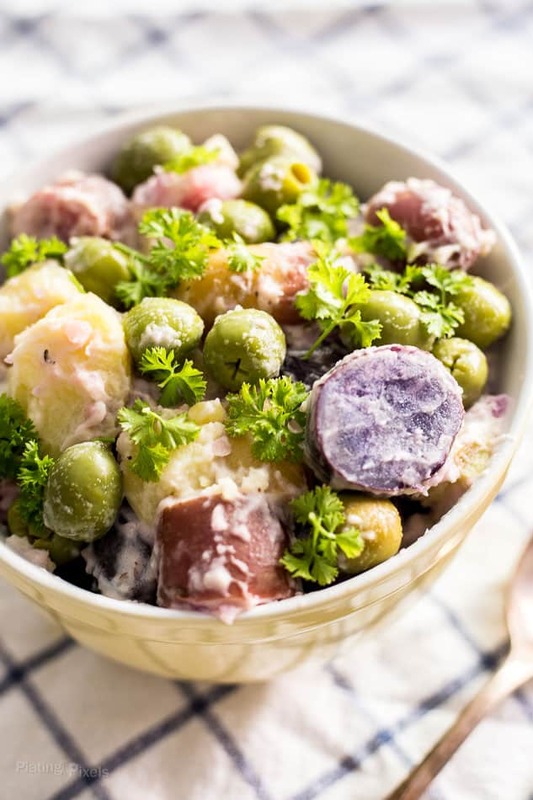 Serve this Green Olive and Potato Salad at your next potluck, party, family meal or any other occasion. This quick and simple recipe is an easy way to enjoy potatoes and a flavorful spin on traditional potato salads. Fingerling potatoes with mayo, vinegar, garlic, castelvetrano olives and fresh parsley. Serve warm or cold. Wash potatoes and trim to ¾-inch or smaller pieces. Place in a large pot and fill with water until submerged at least 1-inch. Stir in salt and heat to a boil on high. Cover, reduce heat to medium-low and and cook until tender, but still firm; 15-20 minutes. Remove from heat, drain and rinse to stop cooking. If serving warm: Cool slightly before preparing. If serving cold: Cool to room temp then chill completely in fridge. In a large bowl, gently stir together cooked potatoes, mayo, garlic, vinegar, salt and pepper. Fold in olives and parsley, and serve. 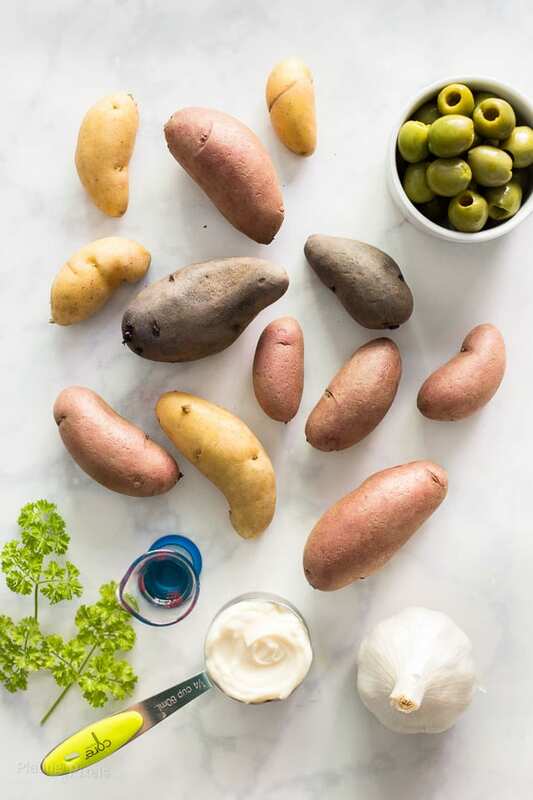 I love, love, love recipes with fingerling potatoes! This salad is so colorful and appetizing. Pinned! Potatoes and olives? Oh I must try this. Sounds like delicious combo. Well it surely looks great! What a colourful side! I love that you have used different varieties of potato. Delish! What a unique recipe! 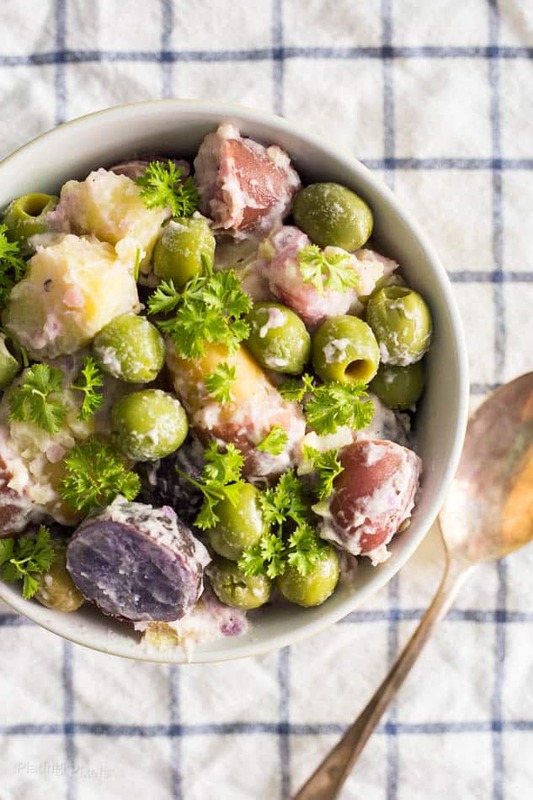 I love olives but have never had them in potato salad…I must try!